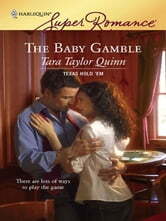 Annie Kincaid has never held the right cards, not when it comes to love. Twice married, twice divorced, she's given up on finding her soul mate--though not on having a family. So Annie's decided to have a baby. On her own. But her brother, Cole, thinks that's a huge gamble, and she can't disagree. At the very least, he tells her, she should go for a known quantity and ask his old friend and best poker buddy, Blake, to be the dad. Blake's certainly a known quantity, all right.